Cool, funny, cute, or otherwise attractive pinback buttons with memes, owls, nerd glasses, peace signs, and more on Zazzle. I saw a movie last night about a teenager with her school bag full of pinback buttons and remembered my own days as a teenager as well as the people who sell pin buttons downtown here in Bucharest. Looking at pinback buttons on Zazzle, I noticed that, not surprisingly, many of them are political, having to do with the Obama campaign of 2012. I then looked up pinback buttons on Wikipedia and learned that button badges have appeared on the political stage in the US in 1789, during the first presidential inauguration of George Washington. I found this information on other sites as well. What surprises me is that political buttons weren’t first used on the campaign trail. In any event, these first button badges were either sewn to a coat lapel or worn as pendants. But this article is not about political buttons. Instead, I’ll be showing you some buttons in the Cool category on Zazzle. Of course, cool is a matter of taste. Some of them are more funny or cute than cool. Hard to say what cool is, really. There are many “Cool Story, Bro. Tell it Again” buttons. I suppose these fit the category description to a T. And yet I’ve seen this statement so much on Zazzle buttons and elsewhere online that its coolness factor may have lost its currency. 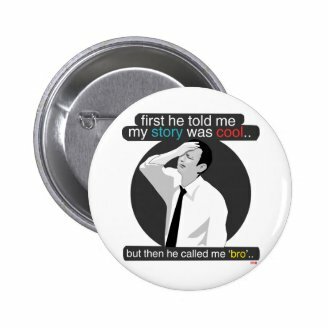 But there is another version of “Cool Story, Bro” which, to my eyes at least, was rather fresh and funny. I’ll show it below, together with more “cool” pinback buttons. The first funny button that caught my attention on Zazzle was a pair of cartoon eyes peering out from the darkness. It’s designed by funnycutemonsters, who has also placed it on iPhone cases, with and without teeth. There’s also a funny business card that you can make your own by personalizing your name and other details. And there’s a cute Rickshaw 15” MacBook sleeve customized to show not just the eyes, but also spiky teeth hanging down from the flap. The designer has done a few other products as well. With these cartoons eyes. But funnycutemonsters has plenty of funny, cute, cartoon monsters designs that will appeal to kids. Another designer, kbilltv, has done a Cheshire grin in the same key: white teeth on a back background. He has made two versions of this toothy grin. The second one, a more pronounced smile, he placed on stickers and T-shirts. I find it rather fun. Grin II comes on white and black T-shirts. 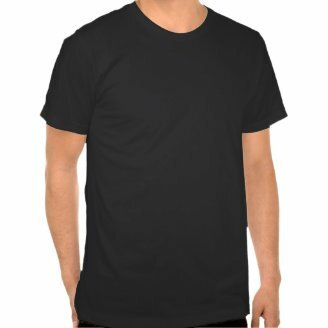 I find the black T-shirt very appealing and I can imagine it glowing under black light on the dance floor. By the way, do you know how black lights work? They emit low-power UVA light. You know, the kind you try to protect yourself from with sunscreen. Only this one is safer, and long-wave ultraviolet A radiation is not as bad as short-wave ultraviolet B radiation anyway. You may have noticed that apart from your white shirt, your teeth glow under a black light as well. 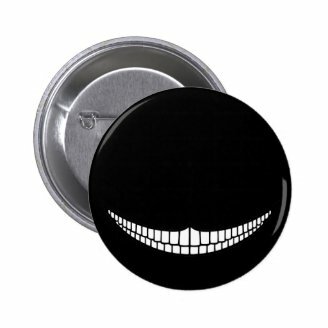 Well, since I got to talk a little about white on shirts and black lights, I’ll show below not just the Cheshire Grin I button, but the Cheshire Grin II black T-shirt as well. There are many peace signs, too, some designed in a simple, minimalistic style (just the bars), or with psychedelic outbursts of colors. There are many such flower power buttons to choose from on Z. I like the simple black-bars designs, but I’m also a little partial to the cute flowery pin buttons that have sprung up in the past few years. Cool Story, Bro. Tell It Again. AKA First he told me my story was cool . . .
Another very common design is the Cool Story, Bro one I mentioned earlier. Some believe the meme was inspired by the 2003 Zoolander movie, which featured one funny instance of “Cool story” in response to a long account by Owen Wilson as Hansel. Of course, it’s hard to tell whether there is a connection, especially as the first instance of it with Bro tagged on dates from 2008, when it was first used on a video games message board. In 2009 it entered the now-popular Urban Dictionary, then it appeared on the MTV show Jersey shore and spread on innumerable macros and products. Judging by popular buttons and T-shirts and mugs, etc. 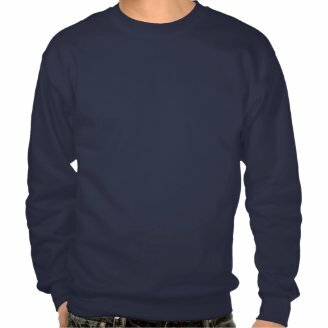 on Zazzle, it’s still going very strong. By now, many of the designs employing this meme have “Tell it again” pinned-on. It sort of takes the fun away for me. I much better like a version I’ve only spotted today. See for yourself below. First he told me my story was cool . . . There are badges for those who perceive themselves as nerds, too. The temptation is there to include the seventies-style nerd glasses in the design, and many buttons do include them. Not very successfully though. But if you look hard, you come upon better designs. One of them involves a cool cat with nerd glasses. Partially blue-toned. The designer is the same kbilltv of the Cheshire grin. He has used this blue nerd cat on a dark blue sweatshirt as well, and it’s rather nice. So I’m thinking I’ll include both button and shirt below. Speaking of buttons: note that they come both round and square, and that the round ones come in different sizes. The square buttons are 2”, and the round ones 1 ¼” (small), 2 ¼” (standard), 3” (large), 4” (huge – uh huh), 6” (colossal – really?). 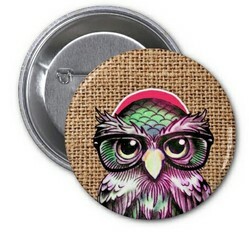 Then there are nerdy pinback buttons for owl lovers. See my favorite below to the left. It really works to have a symbol of wisdom with nerd glasses. Also love the funky colors and the tattoo-style of the design. As a side note, not all owls are nocturnal. Some of them, such as the snowy owls, are actually more active during the day. Which is rather interesting, as this bird has come to stand for both good and bad things. One thing is for sure: there are more and more owl lovers around, and some of them even have an owl as ring bearers at their wedding. See below to the right another owl design, with “CHILLIN’” in sixties font underneath. Hope you’ve enjoyed this page. By way of thanks, here's a toothy rabbit with SMILE. Remember there's more cool stuff on Zazzle. Pin buttons, T-shirts, sweatshirts, mugs, mousepads, tea pots, iPhone/smartphone cases, you name it. You can choose a fun design, or a cute one with your monogram, or a fully personalized design with your text (your name, etc. ), photos, etc. Here are some of the fun stores again. They have more than just pin buttons. I haven't sold any of these but looking at them has certainly put a smile on my face now and then :) I remember a party in that film, but did it have black lights? Mira, Cool buttons, sis! Show them again ;-D! Your section on black lights and glows in the dark makes me think of the party scene in The Theory of Everything film that I've reviewed about Stephen Hawking. These are so cute. My husband likes this sort of stuff. Yeah, cartoon buttons are fun. I wish there were more self-adhesive buttons around. I always have notebooks to decorate ;-). Will have to see if you can design some at Zazzle. Love the cartoon buttons, they are cool. As a teenager, I really would have loved to collect them - had they been available. I wish I had kept all my buttons from my teen days. True, they were mostly "taking a stand" types of buttons. It's fun having some non-political buttons, too. I agree that teenagers don't cover the whole of their bags with these buttons as they used to, but they're still around. I like their retro cool myself. Thanks for visiting, Elias! There was a time when it was trendy to wear these pin buttons. Nice colection, Mira. The nerd cat is my favorite though!